What Are The Best Online Bachelor's in Public Relations Programs? What Else Can I Expect From an Online Bachelor's in Public Relations Program? The public relations field features fast-paced environments and exciting careers. Job responsibilities include writing editorials and planning promotions that connect organizations with the community. Public relations specialist careers are projected to see a 6% job growth by 2024. The most common job setting for a public relations graduate is in an office. This career path allows you to serve as an integral figure in the relationship between business, government, and the general public. A bachelor's in public relations prepares graduates for careers as PR specialists, event planners, fundraising managers, and copywriters. Program electives allow students to customize their coursework to fit their professional interests, and programs often include topics in nonprofit grant writing, crisis management, and campaign planning. Many public relations programs offer specializations in areas such as information systems and project management. While PR programs share common learning outcomes, requirements will differ between schools. Some programs may require a capstone course or internship. Final projects allow students to integrate knowledge acquired throughout their studies and develop communication strategies that fit within their career goals. Figuring out what your career and personal goals are will help you choose the right program. UF's College of Journalism and Communications offers a BS in public relations. It's an in-depth program that develops students' PR skills and proficiencies. The 120-credit program covers key areas in writing, research, analytical skills, media relations, publications production, and mass communication law. UF students competing in the Public Relations Student Society of America's Case Study Competition have won more competitions than any other university in the nation. Admission requirements for the public relations bachelor degree online include a high school diploma or GED and SAT or ACT scores for freshmen. Competitive, upper-division transfer students must have a minimum 2.5 GPA and have completed certain classes, which include argument and persuasion, American history, introduction to statistics, and general psychology. Graduates are qualified for positions such as technical writer, communications specialist, campaign and event manager, and social media coordinator. Penn State's World Campus offers many online programs, including a BA in advertising/public relations. The interdisciplinary bachelor's in public relations teaches students how to develop meaningful content and impactful messaging. The 120-credit bachelor of arts in advertising/public relations includes courses in law, statistics, psychology, research, and basic writing skills. 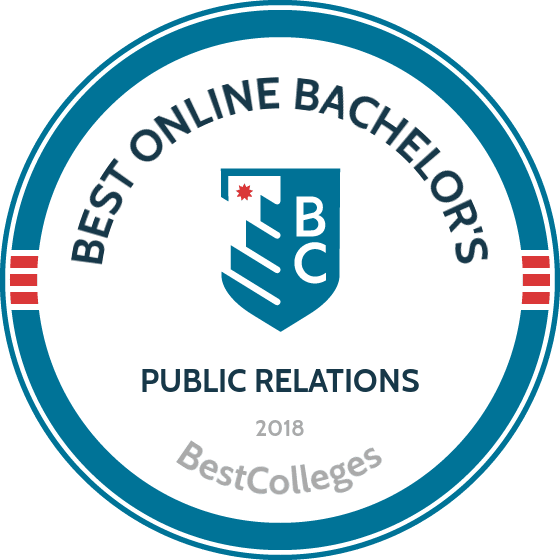 The public relations bachelor degree online has a 21-credit option in strategic communications, which has students take coursework in media relations, world media systems, research and analytics, social media strategy, and more. Students can participate in a three-credit internship at a newspaper or public relations or advertising agency. Admission requirements include a high school diploma or GED and courses in economics and English with a minimum 2.0 GPA. Penn State delivers its programs asynchronously, and professors have expertise in teaching online courses. Online learners have access to a full suite of services, including academic advising and technical support. SNHU offers a BA in communication with a public relations concentration that teaches students how to build relationships between organizations and the public. The 120-credit curriculum includes courses in journalism, mass communication, social media, and media ethics and law. The PR concentration includes the study of writing for public relations, electronic PR, and a capstone project. The project requires students to develop, pitch, and manage a campaign for a real client. Students will learn the communication strategies and tools necessary to reach a wide audience. Coursework for the public relations bachelor degree online is delivered asynchronously. Admission requirements include a high school diploma or GED. SNHU's tuition is among the most affordable in the nation, and up to 90 credits can be transferred into an undergraduate degree. U.S service members receive a 30% tuition discount. CBU's Online bachelor of arts in public relations provides a faith-based environment where students apply and learn real-world skills. The accelerated program targets transfer students with at least 24 credits and can be completed in 16 months. The 48-credit major includes course subjects in oral communication, global digital engagement, media ethics and copyright law, PR issues and crisis management, and business literacy for PR professionals. Students are also required to take six credits in the Bible and Christian thought curriculum. Classes start every eight weeks and are delivered asynchronously using Blackboard. Online learners have access to an array of resources and services, including continuous online tutoring support. The public relations bachelor's degree online is cost-effective, and CBU offers a full suite of financial aid options, including grants, scholarships, and federal loans. The integration of Christian faith is integral to all programming at Pennsylvania's Geneva College. The bachelor of professional studies in public relations focuses on relationship-building, managing channels of communications, and the promotion of an organization's positive public image. Coursework in the bachelor's degree in public relations includes the study of biblical values in PR, communication theory, crisis management, understanding consumers, and graphic design and digital media. Geneva has a chapter in the Public Relations Student Society of America, which gives students the opportunity to network with PR professionals. Students with transferrable credits can complete the public relations bachelor degree online in 16 months. Graduates are prepared for careers as PR coordinators, social media strategists, and media spokespersons. Admission requirements include a high school diploma or GED and competitive SAT or ACT scores. Students are taught in classrooms with a 13:1 student-faculty ratio, giving students more opportunity for individualized attention. This section serves as a guide to assist prospective PR students in the process of pursuing their online degree. While details differ depending on the program and school chosen, the following information highlights common features of a public relations bachelor's degree online and other important topics to consider when selecting an academic program. While courses may vary slightly, the following sample curriculum highlights common topics found in a bachelor's degree in public relations. Each course provides students with a specific skillset that's needed for careers in the field. Principles of Public Relations: This course provides an overview of the field of public relations. Students develop skills to promote positive publicity and become familiar with concepts and tools used in the field. This foundational course prepares students for careers in PR management, community relations, and public affairs. Electronic Public Relations: This course familiarizes students with technology-based PR strategies. Students learn how to ethically use social media and effectively communicate through digital formats. Knowledge of technology communication prepares students for careers as media relations specialists and press agents. Media Planning: Students gain skills in media plan development. This course examines the process of message distribution and emphasizes the use of consumer research to guide media planning and strategies used in a variety of formats, such as television, radio, and newsprint. Special events coordinators and executive directors rely on knowledge of media planning. Writing for Public Relations: This course examines the fundamentals of writing and provides students with an overview of writing techniques for copywriting. Students learn how to write news releases, editorials, and brochures. This course prepares students for careers as feature writers and copywriters. HOW LONG DOES IT TAKE TO GET AN ONLINE BACHELOR'S IN PUBLIC RELATIONS? A public relations bachelor's degree online takes about four years of full-time study to complete. Part-time students may take five to eight years to earn their degree. Some programs offer single consecutive courses that require part-time status. The average curriculum consists of 120-124 credits. Internship requirements may lengthen the time it takes to complete the degree, while previously earned credits and accelerated semester structures shorten the path to degree completion. Online public relations degrees allow students to pursue their degree at an individual pace or through a cohort learning model. Self-paced learning programs often have rolling admissions dates, and students independently complete assignments at their convenience. Cohort learning fosters a group educational experience, and students often begin their program in the spring or fall semester. Students in a cohort program progress through the curriculum together and create learning communities that promote interconnection. The top online bachelor's programs are accredited. This assures students that the program and university adhere to educational standards set forth by an accrediting body. The majority of U.S. universities are regionally accredited. Six regional accrediting associations exist in the U.S. and set the standards for universities in specific areas. National accrediting agencies commonly accredit vocational and trade schools. While regionally accredited universities tend to cost more to attend, nationally accredited universities are less standardized and credits may not transfer to regionally accredited schools. When choosing an online school, it is important to search for DEAC accredited programs. Online schools accredited by DEAC participate in assessments and peer reviews to ensure academic quality. ACEJMC accredits mass communication programs and promotes professional standards through the rigorous evaluation of program curriculum, instruction, and diversity. Regional and national accrediting agencies are recognized by the U.S. Department of Education (ED) and the Council for Higher Education Accreditation (CHEA). While the ED does not play a role in the institutional accreditation process, it ensures that accrediting agencies enforce standards. Similarly, CHEA employs recognition standards that promote academic quality and institutional accountability. Both the DOE and CHEA play important roles in the advancement of higher education, such as requiring the ongoing self-scrutiny of accrediting bodies. The ED and CHEA provide extensive databases of accredited universities and programs, allowing prospective students to make informed decisions about their academic futures. A bachelor's degree in public relations provides students the opportunity to advance their careers and improve their potential earnings. Most entry-level positions in public relations require a bachelor's degree. Data from the BLS demonstrates that higher education positively impacts annual earnings. The following table contrasts annual earnings of careers in public relations and similar areas in relation to their educational training required. PR careers that require a bachelor's degree offer higher salaries with increases up to 70%. Factors that influence annual earnings of public relations specialists include work experience, employer industry, and location. The following table features data from the BLS highlighting the highest paying states and corresponding annual earnings for public relations specialists. Not only does the District of Columbia provide public relations specialists with the highest salaries, it has the highest concentration of employment in the field. Graduates of public relations programs possess the knowledge and skills needed to pursue a variety of careers, including entry-level positions as PR specialists and executive roles as PR and fundraising managers. The following careers illustrate the occupational paths available to students upon earning their bachelor's degree in public relations. The following careers require strong interpersonal, organizational, and problem-solving skills. Fast-paced work environments and frequent deadlines are common of these careers. Public relations specialists conduct a variety of tasks, including writing press releases, helping clients communicate with the media, and maintaining an organization's image. A bachelor's degree in public relations prepares students for entry-level positions that often consist of assembling speeches and maintaining an organization's files. An event planner ensures the smooth operation of an event from start to finish. Tasks include planning the time, location, and cost of the event; reviewing bills; and approving payments. Several planner specializations exist, including corporate planners, government meeting planners, and nonprofit event planners. Public relations managers develop advertising and promotion programs to maintain the public image of their employer. They convey their organization's point of view to its audience through the use of media and follow social and political trends that impact their organization's image. Fundraising managers apply for grants, contact potential donors, and devise fundraising strategies. Both positions require a bachelor's degree and several years of work experience. Advertising managers communicate with potential buyers and create product interest. Promotions managers increase sales through purchasing incentives, such as discounts or rebates. Marketing managers identify the need for new products and potential markets. Shared duties include planning promotional campaigns, negotiating advertising contracts, and conducting market research studies. Managers have several years of work experience and often begin their careers as public relations specialists. Writers in the field of public relations often establish careers as copywriters. Job duties include preparing advertisements, promoting sales, developing slogans, and creating advertising themes. Copywriters work with clients to develop content. Copywriters usually hold a bachelor's degree in public relations or a related area and have skills in web page coding. Professional organizations provide public relations students and recent graduates with numerous opportunities, including access to continuing education programs, recent job postings, and conferences. Professional conferences allow students to network with professionals and explore the latest PR topics. These invaluable experiences expose new professionals to diverse perspectives presented by leaders in the field. Professional organizations emphasize ethical conduct and professional advocacy. Extensive job boards connect recent graduates with potential employers around the world. Many professional organizations provide access to scholarly publications and case studies. PRSA provides a variety of professional development opportunities, such as workshops featuring topics in online brand management and building media relationships. PRSA offers sponsorships for businesses, including access to international conferences and email marketing. Members of IABC have the opportunity to engage in local chapters and compete with global communicators in the Gold Quill Awards. Members receive access to downloadable training videos and a monthly online magazine that features cutting-edge communication strategies. Headquartered in the UK, IPRA represents individual professionals and provides online training and access to worldwide events. IPRA hosts global PR summits that feature diverse PR speakers who work for corporations such as Lego and Sony Music. A variety of options exist to help pay for your public relations bachelor's degree online. Federal aid programs provide students with financial support. To begin the process of securing federal financial aid, complete the FAFSA online. In addition to federal aid, numerous scholarships and grants exist to help reduce the cost of tuition. Universities and public relations professional organizations offer scholarships, including the Gary Yoshimura Scholarship and the Bill Gove Scholarship.